Our summer program runs from June until August; however, as a volunteer you will be able to choose which sessions work best for you. Our volunteer positions are filled on a first come first serve basis so please get your application in as soon as possible. Clinical Volunteer – (RN, LPN, NP, RT) Ten nurses per summer session are integrated into the camp cabins and provide unobtrusive medical care. Experienced and caring, nurses are onsite for a minimum of one six day session. If you are unable to commit to a whole week, Camp Inspiration (a ventilator dependent focused week) utilizes nurses and respiratory therapists in 12 hour shifts. 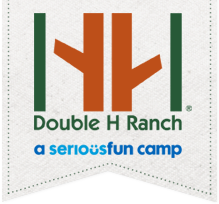 Session Volunteer – Volunteers join a cabin group as a Cabin Counselor and stay onsite with us at the Ranch for a full session. Session Volunteers work alongside our full time staff to move campers through program areas and assist with daily needs, while creating a fun, empowering, and safe camp environment. Double H will provide room and board for the time you are here. The age minimum to be a session volunteer is 19 years old or have at least one year of college experience. General Volunteer – General volunteers help in many different areas of our residential summer camp program. Volunteers commit to a minimum of six volunteer shifts over the course of the summer program. Some volunteers choose to come one day per session, and other people use the program flexibility to fit Double H into their schedule wherever possible. Program coverage runs in morning and afternoon shifts, from 9:30am -12:30pm and 3:30pm -5:30pm. The age minimum to volunteer in program areas is 16 years old. If you have any questions, please contact the Double H Ranch at 518-696-5676.